The European champions will again be without Neymar and Lionel Messi, who are still on extended leave, following their participation in the Copa American earlier the summer, but manager Luis Enrique expects the Spanish champions to be tough company for Chelsea. Tuesday night’s game at FedEx Field will be Barcelona’s third in preseason, after beating MLS side Los Angeles Galaxy in the first contest and then losing to Man United. Chelsea, in the meantime, are coming off a shootout victory over PSG at the weekend after both sides ended regulation knotted at 1-1. 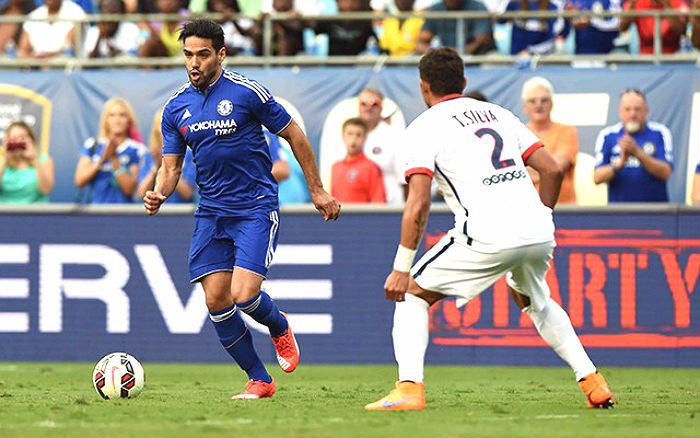 After coming on in the second half against PSG on Saturday, striker Radamel Falcao is set to be given more playing time against Barcelona, Blues boss Jose Mourinho revealed. He also made note that Juan Cuadrado and Willian, who were also among the substitutes in the last outing, are in line for an increase minutes, although they are unlikely to start. “I discussed it a lot with [assistant coach] Rui Faria and we thought that 20 minutes of football is more rich, has more ingredients than training in a small group of three,” Mourinho said on www.chelseafc.com. “So we decided to give Falcao, Willian and Juan Cuadrado this 20 to 25 minutes which was very good for them. Former Liverpool forward Luis Suarez, who was very impressive against Manchester United and was unlucky not to grab a hat-trick in the first half, will continue to lead the attack for Enrique side, with Messi and Neymar still away. Spanish forward Pedro, a man strongly linked with a move to Old Trafford before the transfer window closes, will also start for Barcelona in the attack as he looks to prove to his manager that he is more than capable of starting at the Camp Nou. Former Barcelona attacking midfielder Cesc Fabregas will face his former club, while Eden Hazard, Diego Costa, Oscar, Gary Cahill and John Terry are also expected to feature for the Premier League champions.